WASHINGTON – A month after it announced plans to develop a new solar power plant in Gila Bend, Vasari Energy was back in November to double down on its Arizona investment, expanding the plant’s capacity to power more than 7,000 homes. For California-based Vasari Energy it was a smart business move to bolster the company’s planned solar portfolio. But experts said it was just more evidence that Arizona is an ideal state for utility-scale solar projects, a status they expect will continue as the infrastructure needed for solar plants becomes more affordable. Arizona currently ranks second in total installed solar capacity after California, the nation’s undisputed leader, despite rising challenges from new competitors across the South, such as North Carolina and Texas. More than 100 solar facilities are operating or under construction in the state, according to SEIA data. These projects could have a large effect on the Arizona economy, said Auriane Koster, a solar expert with the Julie Ann Wrigley Global Institute of Sustainability. The development of the solar industry in the state has the potential to attract and keep a skilled workforce. “A private investor coming in and doing a large solar plant is going to increase the economy in the state. That brings in more money in the state. It provides jobs,” she said. Nearly 7,000 people in Arizona were employed in a range of solar industry jobs in 2015, according to a jobs census produced by the Solar Foundation. It’s a factor that Vasari Energy considered when deciding to move to Gila Bend, said Vasari Executive Vice President Sam Lipman. “We also have to look at what we give back to the community with these projects. Obviously being a solar company, we look at things a little differently,” he said. Once online, the planned Vasari plant could produce 140 megawatts of electricity for homes across the state from Gila Bend, a town that encourages energy companies to build solar plants through special zoning rules. 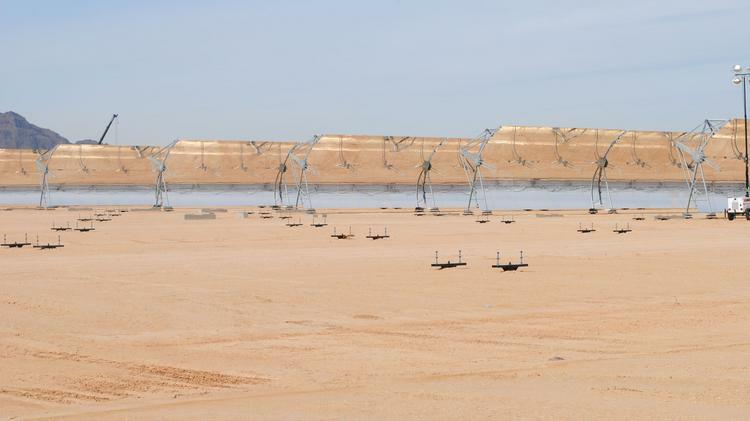 It would not be the largest solar energy producer in the state, but by solar-production standards the Vasari plant would be relatively large, according to the Arizona Corporation Commission. Solar-panel plants typically produce between one and 50 megawatts of power. By comparison, Arizona’s fossil-fuel power plants are capable of producing between 200 and 2,000 megawatts. The Palo Verde Nuclear Generating Station can produce 3,937 megawatts of electricity, a commission spokeswoman said. But in addition to its environmental and economic impacts, solar power boasts another benefit: When energy consumption is at its highest, so is its power source, the sun. The more sunlight the panels collect during those hours, the more energy the plant can provide to utilities when customers need it the most. Gallagher said utility companies in Arizona are becoming more comfortable with the idea of buying solar energy from large-scale solar projects to meet Arizona’s renewable portfolio standard. Arizona pledged 15 percent of energy generation would be renewable by 2025.